"TriState Lottery - the Tri State Megabucks PLUS from New England"
The Tri State Megabucks PLUS is just one of the US Lotteries that is offered by a Multi-State consortium – in this case 3 States from the New England area of North America. It was the very first Multi-State USA Lottery game to be introduced and is drawn at the NH Lottery HQ in Concord. The 3 most northerly US States in New England – Vermont, New Hampshire and Maine combined to jointly form the Tri State Megabucks back in 1985. Tickets for the Tri State Lottery were first sold on September 3rd 1985. The first draw for the Tri State Megabucks took place on September 14th 1985 and throughout the 3 States it has been a popular New England Lottery game since its launch. All 3 of members of the TriState Lottery are also part of the MUSL (Multi State Lottery Association) and as such, also offer the massive country-wide Powerball. The Tri State Lottery games themselves, though, are not a part of the MUSL portfolio. The Tri State Megabucks PLUS is the very latest game to be offered by the Tri State Lottery consortium – the Vermont Lottery, New Hampshire Lottery and Maine Lottery. It took over on July 26th 2009 from the long standing Tri State Megabucks with the very first draw taking place on July 29th 2009. 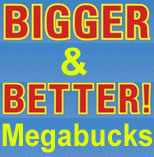 The Megabucks PLUS has been made even more appealing than its predecessor with larger starting jackpots being offered, plus bigger 2nd prizes and better odds of winning the lottery. The Tri State Megabucks PLUS is the traditional draw-style, lotto jackpot game of the Tri State Lottery. It is their premier game and is now even better than the original Tri State Megabucks game which was first introduced way back in 1985. Each of the 3 participating member States refers to the TriState Lottery by its own individual name – the Megabucks Vermont, the Megabucks Maine and in New Hampshire – the NH Megabucks. The jackpot prize for the Tri State Megabucks PLUS commences at U$ 1 MILLION as opposed to the U$ 500,000 starting jackpot of the old Megabucks and each time the top prize is not won a rollover of at least US$ 50,000 occurs. The top prize is then added to the next draw’s jackpot which increases in size until won. This game uses a dual matrix of 5/41 and 1/6 with drawings for the game taking place twice every week on both Wednesdays and Saturdays at 7.59pm Eastern Time. The Tri -State Megabucks PLUS uses a double matrix of 5/41 and 1/6. This means that when playing, you first need to select 5 numbers out of a range from 1 to 41 and then select a MegaBall number out of a range of numbers from 1 to 6. If you match all 5 of the main numbers drawn plus the Megaball, you will be a lucky winner of the Megabucks PLUS jackpot. In addition to the jackpot itself, there are 8 more ways in which you can win on the Megabucks PLUS, with prizes to be won if you match either the 5 main numbers, 4 main numbers plus the MegaBall, 4 main numbers, 3 main numbers plus the MegaBall, 3 main numbers, 2 main numbers plus the MegaBall, 2 main numbers or even just 1 main number plus the Megaball. A Easy Pick facility is available when playing the Tri State Megabucks PLUS similar the Lucky Dip option that is used in the UK National Lottery or Europe’s EuroMillions or the Quick Pick option on many other USA Lottery games – which means that you can get the computer or online lottery ticket sales agent to select all your Megabucks numbers randomly for you. So… playing the TriState MegaBucks PLUS is simple…just select your own 5 numbers plus a Megaball or request them to be automatically generated for you by using the computer-generated Easy Pick – random number generator – facility. The cost of each entry into this TriState Lottery is US$ 2.00. Tri State Megabucks PLUS – Who Can Play? As with most US Lotteries – previously only citizens living in the 3 participating States were allowed to play in any of the VT Lottery, ME Lottery & NH Lottery games including the Tri State Mega Bucks – you used to have to buy your TriState Lottery tickets from an authorized retailer in 1 of the 3 New England member States. Nowadays, though, there are numerous online lottery ticket sales agencies who are both authorized and genuine such as TheLotter – you are able to select your Megabucks numbers online and purchase your tickets without worrying about where in the world you may be living. This is good news of course if you live outside of Vermont, Maine & New Hampshire & the USA but want to play the game and ensure that you have your entry into the next drawing or just want to have the ease and convenience to buy lottery tickets online. Once you have entered into the TriState Lottery draw, you can then easily check the Megabucks results online to see how you have done and check if you are one of the lucky winners. You will need to be 18 years of age to be eligible to purchase a ticket for any of the TriState Lottery games including tickets for the Tri State Megabucks PLUS.